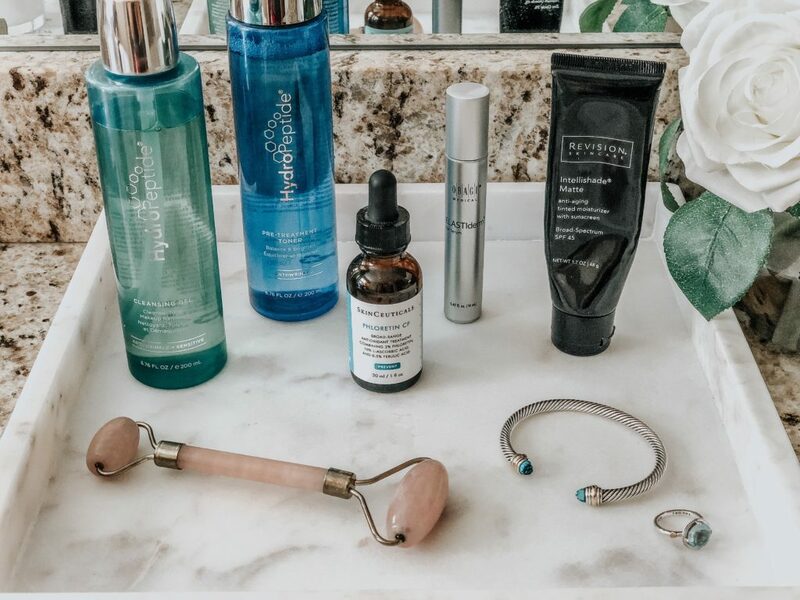 My skincare routine is one of my most commonly asked questions & I’m so excited to have it all in one place for you guys! I’ve been doing some sort of skincare regimen since I was in the 6th grade (anyone else remember Clinique’s 3 step system?!). It may seem like a lot of information at first, but I actually look forward to it every day- especially in the evening! I find that it helps me wind down and relax before bed. 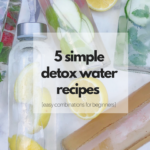 While some of these products are on the pricier side, most are medical-grade and contain a higher qualities or quantities of active ingredients than department store skincare. 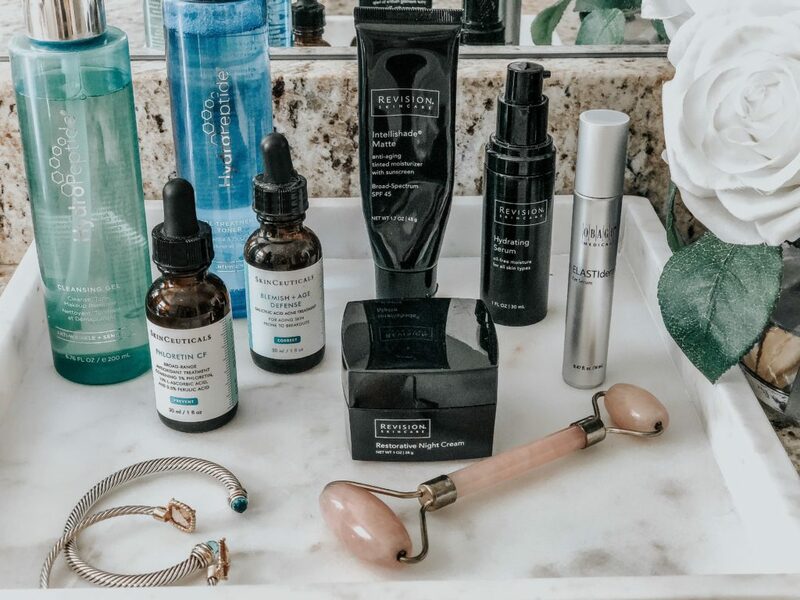 Almost all of these were recommended to me by a medical aesthetician (shoutout to my girl Lauren at Gardner Dermatology) and I have personally used all of these products for over a year and have noticed a huge difference in my skin! 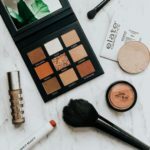 Being a blogger, I will always test out new products and report back, but the following have been consistent players that I always come back to. I used to love MAKEUP much more than skincare, but as I’ve entered my 30s I’ve made a transition into investing in my skin so that I don’t feel like I NEED as much makeup. Keep in mind that I didn’t go out and purchase all these products in one day. When I decided to make the investment in my skin, I slowly replaced one product at a time whenever I ran out. For example, when I ran out of my Neutrogena cleanser I purchased HydroPeptide, when I ran out of Aveeno moisturizer I purchased Revision, etc so it wasn’t a huge purchase all at once. I feel like there’s no more important investment that what you put IN and ON your body, you only get one!! Cleanse. It’s just as important to wash your face in the morning as it is in the evening! You skin accumulates oil, dust mites, bacteria, etc overnight and it’s important to cleanse every AM to cleanse and start with a fresh pallate. I LOVE this cleanser and have been using it for years. It’s very gentle and won’t dry out your skin (bonus: it smells AH-MAZING). Tone. After cleansing, I apply this toner every morning with a cotton ball in small, circular motions. It removes any dead skin or pollutants left on the skin, brightens, evens out discoloration and helps with cell turnover! It’s gentle enough for every day use. Day Serum. THIS. IS. LIQUID. GOLD. If you only purchase one thing to add to your skincare routine, it would be THIS. My aesthetician recommend I use this about two years ago and it COMPLETELY CHANGED my skin. I drastically eliminated dark spots and overall made my skin brighter and clearer- I wish I had a before/after shot! It provides environmental protection by neutralizing free radicals that damage your skin. It works best when layered under your SPF! Moisturize. I’ve been using the Intellishade tinted moisturizer for about two years; I like it because it provides sun protection & also because it evens out your skin tone! It applies similar to a light foundation, so I often wear this solo with no other face makeup on top! I recently received a sample of the Obagi Sun Shield and thought the coverage was similar but the formula was sliiightly thinner (aka easier to apply) so I think I’m going to purchase the Obagi when I run out! 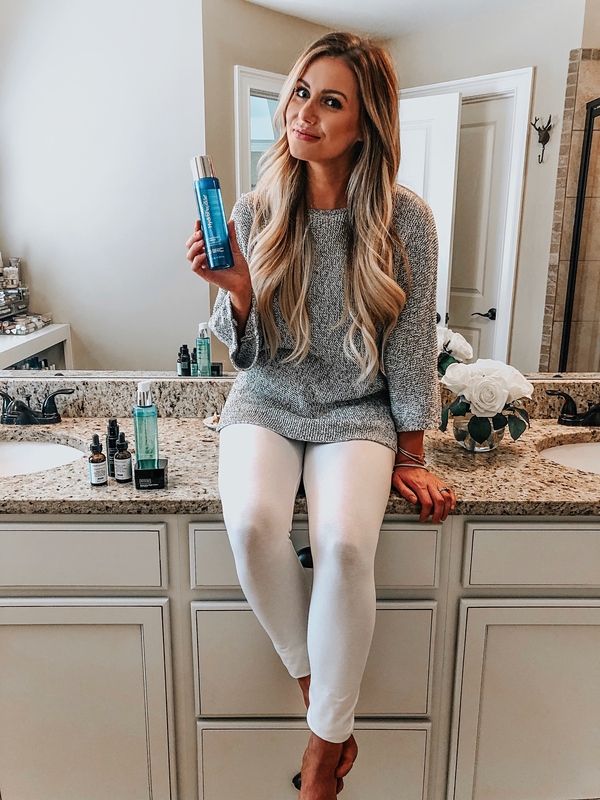 Hydrating Mist- I love this mist to spray on after makeup or throughout the day as a refresher! Cleanse. Same as morning. This cleanser removes ALL of my makeup so I don’t have to use any wipes or oils to take everything off- even eye makeup!! Tone. My aesthetician recommends this salicylic acid toner to almost anyone who is prone to breakouts or clogged pores. This is what helps my skin stay clear, and it leaves your skin feeling “minty” and cool afterwards which I love. Hyaluronic Acid. I wrote about my love for HA last year in this post. 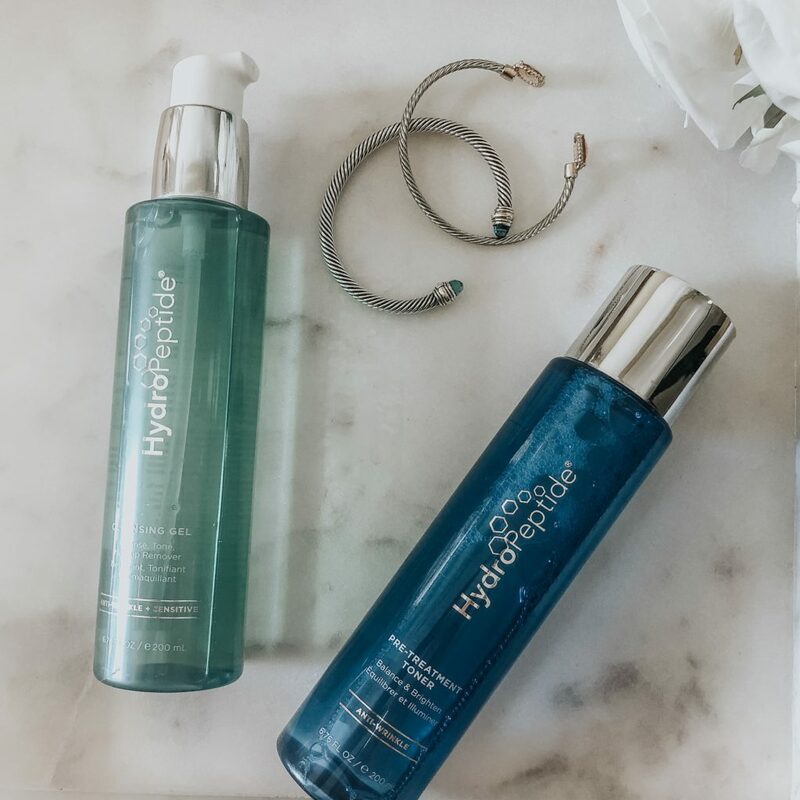 It binds moisture to the cell to help reduce water loss in the skin throughout the day. The best one I’ve found so far is this one by Revision, but I also think Reviva makes a good alternative if you aren’t ready to make the investment. Eye Serum. This is one of my TOP recommendations!! My aesthetician actually said that if this serum contained any more active ingredient it would have to be a prescription! SIGN ME UP! It has a stainless steel roller ball tip that makes it easy to apply on the go (I bring it in my purse on airplanes to help with puffiness) and feels amazing! Malonic acid encourages skin cell renewal while caffeine helps brighten dark under-eye circles and reduces puffiness. Check and CHECK! Moisturizer. Love this night cream, it isn’t greasy, absorbs quickly, and makes your skin soooo soft! It contains clinical levels of an anti-aging peptides that increase collagen production, reducing the appearance of fine lines and wrinkles. Chapstick. Changes on the daily, currently into this Juniper Mint situation by Olivina. It says “for men” on it but like..whatever. Whenever I feel like my lips are getting dry I use the Tarte sugar scrub before applying. It leaves your lips feeling pillow-y soft and tastes delish! Body oil. Last but not least, I mix almond oil with my body lotion to make your skin superrr soft while you sleep. I have VERY dry skin and am prone to eczema and this has made the biggest difference! That’s a wrap! 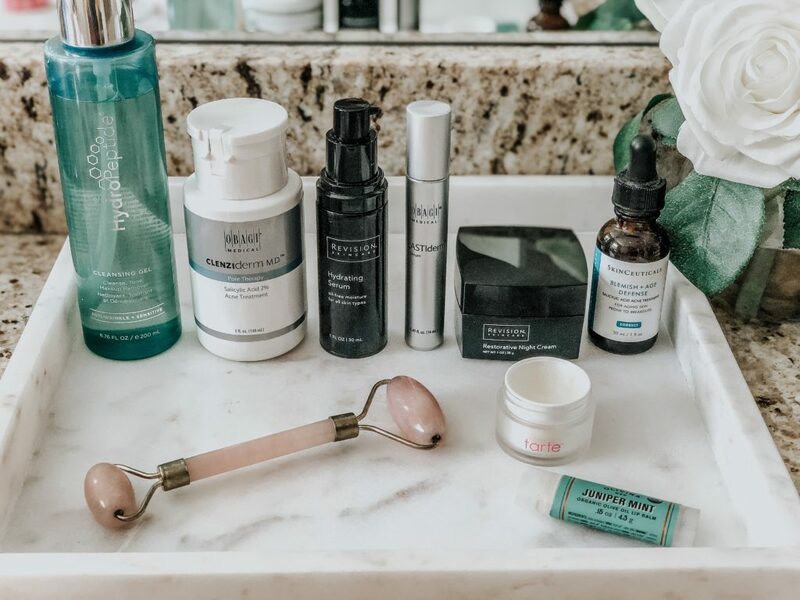 What skincare product can you not live without! ?